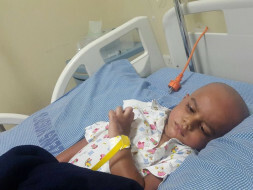 For the last two years, 3-year-old Mohammad Sufian, son of Mohammad Shareef has been fighting with a life-threatening cancer called lymphoblastic Leukemia. It is a cancer that starts from the early version of white blood cells called lymphocytes in the bone marrow. Leukemia cells usually invade the blood fairly quickly. They can then spread to other parts of the body if not treated at an early stage. Sufian has started chemotherapy sessions and will need to undergo sessions for the next 2 years in order to recover. 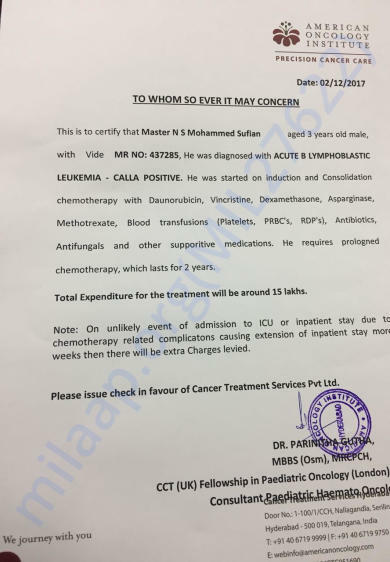 The total cost of his treatment is around 15 lakh Rs. Shareef does not have the funds to save his son and needs our help. Your contribution can help Sufian and give him the treatment he deserves. Mohammed Sufiyan is doing ok. He is undergoing his treatment and is recovering. He is stable and is responding well to the treatment. Thank you for the wonderful support that you have shown towards my son Sufian. He is doing better now compared to earlier. He has undergone three chemotherapy cycles and is responding well to the treatment and has had no side effects so far. He underwent a bone marrow test today to ascertain the effectiveness of the treatment. Based on the reports the doctors will be suggesting the future course of action.